The 2014 McDowell Alumni Hockey game was played on Dec. 27th with a total of 29 graduates and former players participating in the event. Once again the game provided more drama, excitement, laughs and memorable moments than could have been expected as Michalak’s Majesties broke open a tie game midway through the 2nd period to defeat the BigShots by the final score of 14-6. Brothers Tony Michalak (’05) and Chris Michalak (’08) served as honorary co-captains of the “Majesties”. The event, played at the Mercyhurst Ice Center, was attended by nearly 100 fans that not only witnessed an entertaining hockey game, but rekindled old friendships as well. It didn’t take long for the BigShots to get off a “big shot” in the big game as Gary Peterson (’04) took a pass from Mike Langer (’02) and found the back of the net just 11 seconds after the first puck drop to give the team in white a quick 1-0 lead. But the Majesties finally got their game going 5:21 later when a couple of 2005 classmates teamed up for the games tying score, as Kaylan Rhoades scored with a helper from co-captain Tony Michalak. The BigShots would respond 4:46 later as Justin Henning (’04) would score with an assist going to Jon Haulik (’11) to give the BigShots a 2-1 lead. However, with 2:58 left in the opening stanza, it was the class of 2010’s turn to light the lamp. Shane Reese connected on a feed from Sean Perhacs for a goal that was just like the good ol days and the score was now knotted at 2 apiece. But before the period would end, the see-saw affair would tip back in the BigShots favor as Justin Henning (’04) would capitalize on a penalty shot attempt with 1:41 left to give his team a 3-2 lead at the break. Both goalies came up big in stopping a barrage of first period shots as Andrew Greaves (’11) turned away 14 of 17 shots for the Majesties while recent grad Evan Szablewski (’14) stonewalled 16 of 18 shots for the BigShots. Ryan Guzek (‘12) would light the lamp for the Majesties 3:04 into the 2nd period with assists from Shane Reese (’10) and Trevor Shaw (’07) to, once again tie the game – this time at three’s. Tony Michalak (’05) would break the string of alternate goals by scoring with 13:32 left to give the Majesties their first lead of the game at 4-3. Kaylan Rhoades was credited with returning the assist favor from the Majesties first goal. But it didn’t take the BigShots long to retaliate, as 12-year graduate Mike Langer (’02) would tickle the twine on a feed from Peter Hlusko (’11), and with 12:15 left in the second period we were tied again, this time at 4-4. It was at the game’s midpoint that the Majesties went on a goal scoring binge by scoring four goals in a 2:50 span. Tallies by Ryan Guzek (’12) from new papa Mike Robinson (’09), followed by Lee Rohan (’03) from Sean Stutzman (’03), and then Tony Michalak (’05) from brother Chris (’08) and Shane Reese (’10), punctuated by a goal from Chris Michalak (’08) from Kaylan Rhoades (’05), gave the Majesties an 8-4 lead in what seemed like the blink of an eye. Jon Haulik (’11) would put an end to the Majesties onslaught by capitalizing on a feed from classmate Peter Hlusko (’11) to pull the BigShots to within 8-5 with 5:10 left in the second period. But the momentum shift was short-lived, as the class of (’03) took over for the Majesties to score three more goals in 1:39. Scott Robinson (’03) would score the first in that span with 4:14 left thanks to help from Trevor Shaw (’07) for a 9-5 lead. Sean Stutzman (’03) would then find paydirt on a pass from classmate Lee Rohan (’03) with 3:02 left in the period, and then Rohan would get a lidlifter of his own with 2:35 left to give the Majesties an 11-5 lead heading to a much needed intermission. 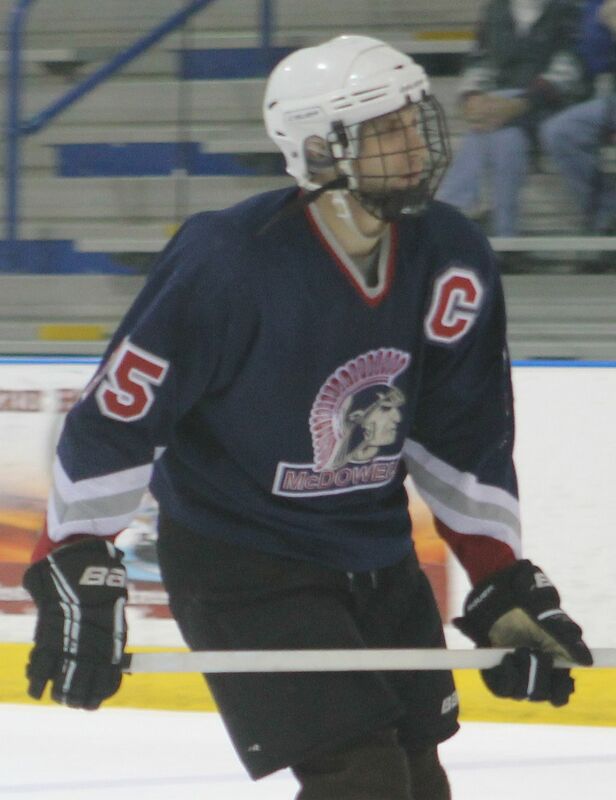 The scoring pace would slow down dramatically in the third period, but the Majesties would get three goals in a 2:30 span from the big sticks of Kaylan Rhoades (’05) from Tony Michalak (’05), Sean Perhacs (’10) from Ryan Guzek (’12) and Sean Stutzman (’03) from Scott Robinson (’03) for a commanding 14-5 lead. Peter Hlusko (’11) would close out the scoring for the BigShots by taking advantage of a penalty shot opportunity with 2:27 left to produce the final score of 14-6. The Majesties used a balanced scoring attack as nine skaters each scored at least one goal. Lee Rohan (’03), Co-Captain Tony Michalak (’05) and Kaylan Rhoades (’05) paced the Majesties with two goals and two assists apiece while Sean Stutzman (’05) and Ryan Guzek (’12) each tallied two goals and one assist. Shane Reese also had a 3-point night in scoring a goal with two helpers. Meanwhile, the BigShots were led in the scoring column by Justin Henning’s (’04) two goals and Peter Hlusko’s (’11) goal and two assists. Mike Langer (’02) and Jon Haulik (’11) each contributed with a goal and an assist. Please check our Facebook page (McDowell Hockey Alumni Page) and the McDowell Hockey website (www.McDowellHockey.com) periodically, as we intend to post some pictures soon. On behalf of the McDowell Hockey Club I would like to thank this year’s participants and fans for their support and generosity. Over $550 in funds was raised through registration fees, donations and 50/50 sales to help benefit the program and offset costs. Each year the goal for the McDowell Hockey Alum’s is to give something back to the program in a monetary way to help support the club’s operating expenses. We hope to increase that amount each year. I would like to publicly acknowledge a family that single handedly volunteered a HUGE effort in making this years’ event a big success. Rick and Betty lou Schau and their kids – son, Eriq and daughter, Ellie did everything from accept registrations, to handing out jersey’s, to providing water bottles, to operating the scoreboard, to selling 50/50’s, to collecting and washing jersey’s. It’s hard-working and unselfish people like the Schau family that are the true MVP’s of programs and events like this. Without question, they stepped up in a big way so that everyone else could enjoy a fun McDowell hockey reunion. To furthermore highlight their level of dedication, Rick and Betty lou volunteer their time as board members of the current McDowell Hockey Club even though their son Eriq (a member of the McDowell Hockey team last year) currently attends Plum High School after being drafted to play Tier III Junior Hockey as the youngest member of the Pittsburgh Vengeance. That my friends, is the ultimate dedication to McDowell Hockey! THANKS AGAIN, RICK, BETTY LOU, ERIQ AND ELLIE SCHAU! A HUGE Thank-You is also in line to the current Booster Club Executive Board Members Alan Hilling, Rick & Colleen Seibel, Tracy Baker, David DiGello, Sharon Bond, and Darcie Galleur for coordinating ice time as well as for their support of the event. I would also like to recognize Equipment Manager Bill Bright for making the jersey’s available for our use. One other person that deserves recognition for being instrumental each and every year in making the game a success by getting the word out to alum’s as well as being the longest continuous alum to participate in the game is John Sorge. John has the knack of combining competitiveness with a light-hearted personality to give the game character and entertainment. It was also great to see some of the current McDowell Hockey Booster Club members turn out to support our effort. Without the help and support of the current booster club members, this event would not be the biggest and most attended event of it’s kind in the area. Last but not least, thanks to all the players and fans that attended this year’s game for making it another well attended and memorable game. The efforts of those that coordinated and participated in this year’s event will hopefully leave an impression on the hockey club and be the foundation for future alumni functions. In order for this event to continue and succeed in the future, it is important that we recruit more volunteer help from within the alumni group of players. If you would like to be added to our E-mail address list or are interested in helping to coordinate next years event in any way, feel free to contact me at: (814) 464-3393 or E-mail at: . 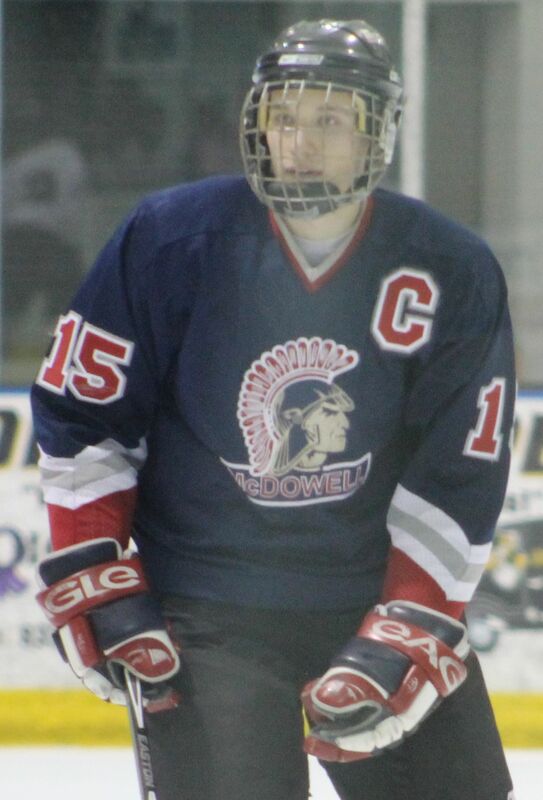 Be sure to “Like” us and keep in touch on Facebook at our “McDowell Hockey Alumni Page”. The 2014 McDowell Hockey Alumni Game was a special one for a handful of families as a record FIVE sets of brothers that are alum’s of the hockey club reunited to play together in this year’s event . . .